Bumper Crop is a 2-vs.-2 minigame found in Mario Party 7. A "bumper crop" is a term used for a plentiful harvest. A Shy Guy waves in a small truck coming up to the area, then the camera zooms out to show the garden, and the minigame begins. 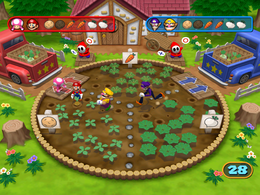 In this minigame the players need to go into a small garden and pick vegetables that are separated in three areas (one for carrots, one for turnips and one for potatoes), and put them in the small trucks. They need to put two of each vegetable. Whichever team gets two of each into their truck first will win the minigame. If neither team can do this after 45 seconds have passed, a draw occurs. Rules – "Work with your partner to load 3 kinds of vegetables into the truck. You must load 2 of each one." Advice – "You can't toss while Shy Guy is holding up the "X" sign. Also, some veggies have no roots." This page was last edited on January 30, 2019, at 12:18.